The first artist to write an autobiography was naturally a Florentine. 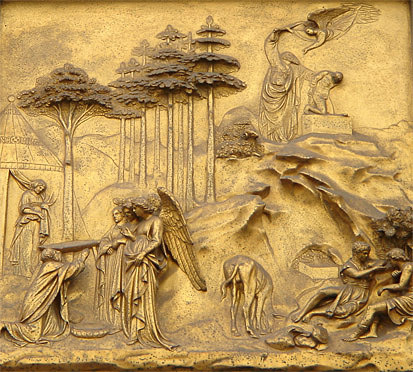 Lorenzo Ghiberti (1378–1455), goldsmith and sculptor would probably be better known had he not spent most of his career working on the sublime doors for the Baptistry after winning the famous competition of 1401 over six others, just squeaking past Filippo Brunelleschi. Both men's famous trial relifs on The Sacrifice of Isaac are in the Bargello. What set Ghiberti apart from his fellow early Renaissance sculptors was his ability to combine Gothic styling and flowing drapery with antique figures and composition. The first Baptistry doors were so well received that he was immediately given the last set to do (1425-52), the doors that Michelangelo called 'The Gates of Paradise'. The original doors are now in the Museo dell’Opera del Duomo. Ghiberti also contributed three bronze statues to Orsanmichele— St John the Baptist, St Matthew and St Stephen.